Brennan hands out applause, while Booth looks on. This is a shot from the show's fourth season finale. Brennan and Booth hang out in The Lab. It's a nightclub that goes by that name. 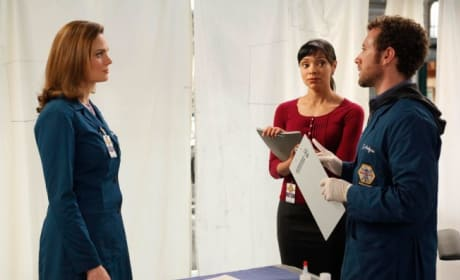 This is a scene from the fourth season finale of Bones. See, Booth and Brennan aren't in every, single shot. 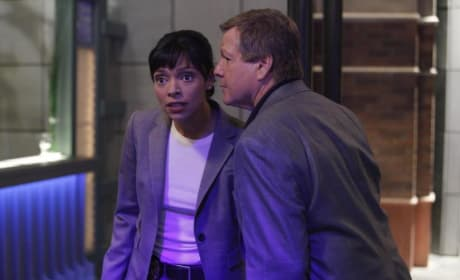 A murder takes place at a nightclub during the fourth season finale of Bones. 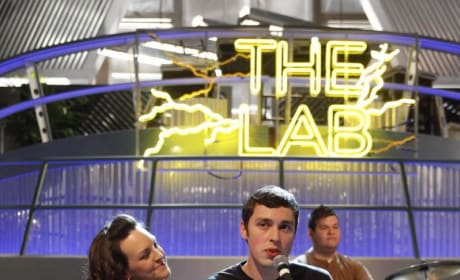 The club is called "The Lab." It's about to get even hotter between Booth and Brennan. The latter wants the former to help her have a baby. Booth tries to make a point in the fourth season finale of Bones. He confronts guest star Ryan O'Neal in this scene. Uh-oh. Booth develops a health problem near the end of the fourth season of Bones. In "The Beaver in the Otter," Jared Booth returns. His brother helps him find a job. A-ha! A bone! This would be the specialty of Dr. Temperance Brennan.